Dextrins are a group of low-molecular-weight carbohydrates produced by the hydrolysis of starch or glycogen. Dextrins are mixtures of polymers of D-glucose units linked by glycosidic bonds. Dextrin is usually defined as a soluble gummy substance, formed from starch by the action of heat, acid, or fermentation. 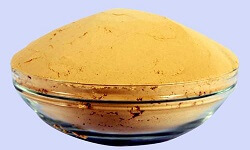 Having dextrorotatory properties, dextrin is used mainly as a thickening agent, as mucilage and as a substitute for gum arabic and other natural substances. Dextrin is produced from starch that has been broken into smaller segments. In water, dextrins form gluey, cloudy and viscous masses. Dextrins are produced by enacting the process of hydrolysis on starches using enzymes like amylases similar to digestion in humans and during malting and mashing, or by applying dry heat under acidic conditions (pyrolysis or roasting). The latter process is used industrially and also occurs on the surface of bread during the baking process, which contributes to its flavour, color and crispness. Dextrin produced by heat is also known as pyrodextrin. Dextrin is useful to food manufacturing as a substitute for fat. Due to its gluey texture, dextrin can mimic fat while contributing less calories to a product. It is also less expensive and will not spoil like fat. As dextrins do not easily react with chemicals, they are specifically suitable for applications in the textile industry. In textile printing, they are used as thickener. Higher grade starch which are free of grit and other impurities ensures that the copper rolls used in printing do not suffer from abrasion. Dextrin is used to make many types of glue and adhesive, including glue and paste for children’s use as it is non-toxic if consumed. The adhesive industry uses large amount of yellow dextrin in the preparation of liquid and dry adhesives. Dextrin is used in dry distemper where 5 - 10% of dextrin, mixed with chalk and pigment, acts as carrier and impact good adhesion of the color of the wall. It is used in the dye stuff industries as diluents to standardize the dye with respect to the range of the color. Dextrin washes out quickly and easily and do not react with chemicals used in the process. It is also used as an additive in froth flotation in the mining industry.